ecomshare has designed over a hundred sites over the past years. From simple to complex, we aim to give our clients a look and feel that works for them and their customers while also providing content management tools that make adding new pages and editing existing content fast and easy. Challenge 1: Allow each department to update content without licensing issues or needing to learn FrontPage �. Challenge 2: Streamline lead management and response times. 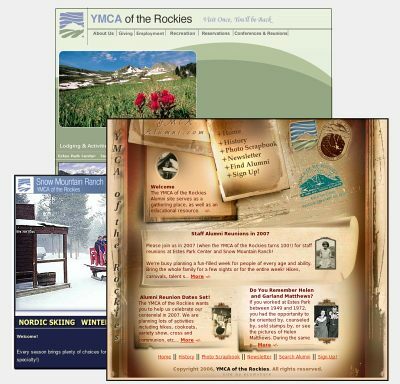 Challenge 3: Seamlessly share content between multiple portals (www.ymcaalumni.com, www.snowmtnranch.com). Challenge 4: Make it look nice without breaking the budget!